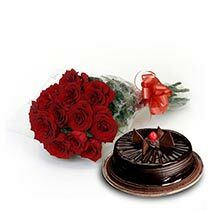 Cake with Flowers: To Turn Romantic Valentine’s Day into a Grand Celebration!! Valentine’s Day is all about the feeling of love. It is the day for the lovers to celebrate the feeling of being in love. It is the day for them to feel special on being loved. So for the romantic Valentine’s Day there needs to be something special and loving thus here we have come up with a vast collection of online Cake with Flowers combo. 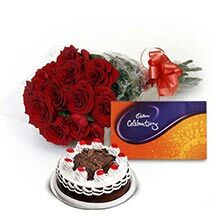 Be it is to express your love to your sweetheart or to make her feel special on a romantic date on Valentine’s Day eve, gifting a Cake with flower combo is always an excellent gifting thing to choose for gifting. In the catalogue there are choices for variety of delightful Cake with Flowers combo to choose buy online, such as A Graceful Gesture-VL, My Sweet Thoughts-VL, Heart shape Black Forest Cake 1.5 kg with Rose, Heart shape Pineapple Cake 1.5 kg with Rose, Little Treasure, Pineapple Cake With Valentine Roses, Romantic Treat-VL, 50 Roses Heart n Cake and more such options. 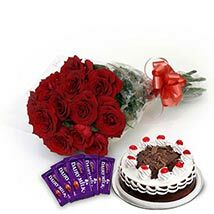 So explore the range and buy cakes with Flowers online at attractive price point.